Create a warm and welcoming seating place in your bedroom, living room or guest room with the gorgeous collection of traditional loveseats. Adorned with button tufts, nailhead trim and elegantly styled arms and legs and further topped with soft and durable upholstery and matching accent pillows, this traditional loveseat collection promises quality with style and comfort. With its imperial look, the Serta Upholstery Belmond Loveseat is perfect for rooms with traditional décor. This ultra-stylish and attractive loveseat features strong and durable hardwood frame and cotton/polyester upholstery with floral design. The cushions are padded with foam to give you a comfortable and relaxing seating experience. 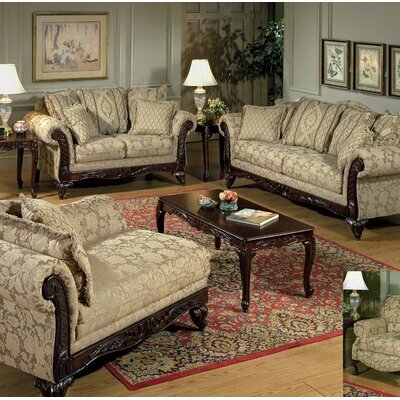 Crafted in United States of America, this elegant loveseat is durable and last long while lending a royal and sophisticated touch to your home. Sturdy wooden frame serves as an anchor for durable seating support. Upholstery materials: Cotton and polyester. Fabric: Clarissa Carmel / Talbert / Tally Carmel. Also available in Momentum Magenta / Safari / Sateena fabric finish. Both seat cushions and back cushions are removable. Machine tested springs for maximum durability and lasting support. Back of the loveseat and pillows are air-blown with polyester fiber or polyurethane foam for a crisp and contoured shape. Sculpted legs with ornate detailing. Nylon bushings to reduce noise. All load bearing areas and stress points of the frame are reinforced with hardwood lumber. Works well for people with height under 5’4”. Requires minimal assembly. Only legs need to be attached. Create an inviting place in your bedroom or lounge with the comfy and graceful Belmont Loveseat. The simple and elegant Belmont Loveseat promises you ultimate comfort. It features plush high-density foam cushions and soft woven upholstery that provide you a cozy seat and a reinforced hardwood frame for long lasting anchor support. It has elegantly pleated rolled arms, welted cushions and dark brown block feet that add further value to its overall look. With a contemporary update, the timeless design of this loveseat will add grace with comfort to your room. Reinforced hardwood frame provide anchor support. Upholstered in durable faux leather. Fabric Finish: Elizabeth Forest/ Florence Jasmine. Multiple cushion seat with welted cushions. Cushions feature eco-friendly, high-density foam. Rolled arms with pleated details. This loveseat comes assembled and does not require any assembly. Add a touch of vintage charm to your living room with the distinctive design of the gorgeous Seymour Loveseat. This aesthetically appealing loveseat features elegantly turned legs in warm and rich brown color and bold nailhead trim detailing at the front face of rolled arms. 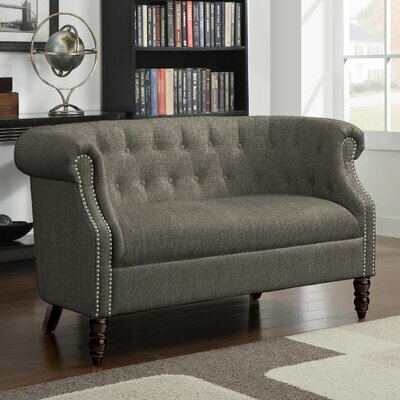 It sports a button-tufted barrel back that is perfect to lean on with your latest page-turner. Crafted from solid hardwood, this statement piece is durable and will be a favorite seating spot in home for many years to come. Built to last, sturdy hardwood frame. It seats two people comfortably. Covered in linen-like polyester fabric. Upholstery color: Smoky Charcoal Gray. Available in more fabric colors including brown, kiwi green and oatmeal. Cushioned with foam and fiber. Rolled arms accentuated with silver nailhead trim. Elegantly turned legs in dark brown finish. Legs are detachable and comes with leg glides. It requires assembly and very easy to put together. Maximum weight limit of this loveseat is 600 lbs. Inspired by the classic Chesterfield design, the chic and stylish Grady 2 Seater Loveseat is ideal for a traditional or mid-century themed home. You can also create a contrasting and appealing setting by placing this loveseat in a room with a modern décor. 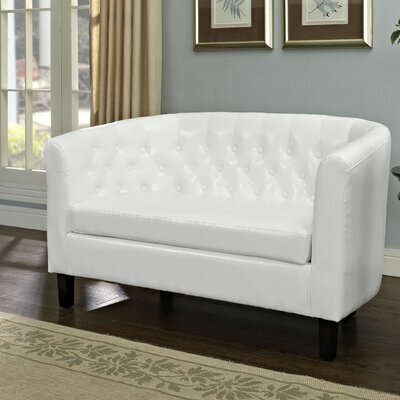 It features faux leather upholstery, deep button tufting at the back and para wood tapered legs. A delight in its own, this loveseat is high on style, comfort and quality and promises ultimate comfort with long lasting durability. This loveseat easily accommodates two people. Frame is constructed from solid wood for long lasting durability. Covered in durable black colored faux leather upholstery. Back is embellished with deep button tufting. Removable and reversible seat cushion. Slightly tapered legs in matching black color. Maximum weight capacity: 285 lbs. 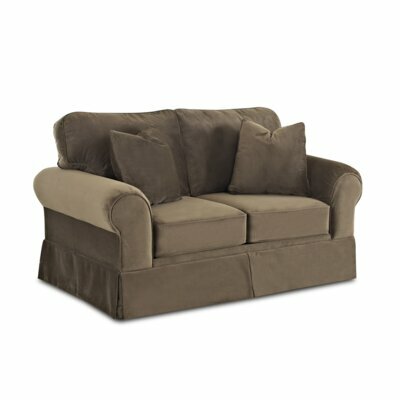 This loveseat comes assembled and does not require any further assembly. One year limited warranty provided by manufacturer. 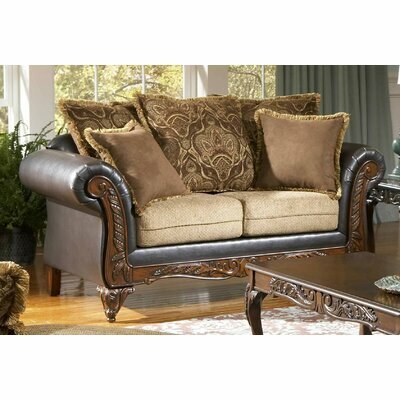 Classic design with ornate sculpted legs and wood trim detailing on the base and front face of rolled arms with a combination of bomber chocolate colored faux leather upholstery and beige colored seat cushions make this loveseat a stunning focal point. Manufactured with quality in mind, this durable and comfortable loveseat is sure to be the favorite conversation spot of your family members. For indisputable quality, it has hardwood frame that offer maximum durability and sturdiness, Certi-PUR foam cushions and easy-to-maintain, hand-tailored fabric. To minimalize environmental footprint, we have also used recycled materials where possible to give you the best in style, design, strength and value. Hardwood frame provides anchor support. Certi-PUR foam for ultimate comfort and optimum durability. Frame is upholstered in durable leather of gorgeous Bomber Chocolate color. Includes scatter back Tudor accent pillows with fringes. Pleated rolled arms with artistic wood trim detailing at front panel. Sculpted wooden legs with classical ornate details. Now you can recreate the warm look of a mid-century living room with the stunning and traditional Bournemouth Loveseat. Featuring sturdy wooden frame, this loveseat promises durability and strength to endure wear and tear of time. The soft linen fabric in beige color lends a sophisticated and radiant touch that adds to its stunning looks. Further accentuated by hand-applied copper nailhead trim and black stained bun feet, this loveseat radiates a delightful aura. It is cushioned with CA117 fire retardant polyurethane foam. Available in multiple color options, the appealing Bournemouth Loveseat lets you choose the one that suits your taste and complements well with your room décor. Covered in durable and east-to-clean linen upholstery. Welted cushions for crisp shape. Cushioned with CA117 fire retardant polyurethane foam. Hand-applied copper finished nailhead trim detailing on the back, base and front panel of arms. Black stained bun feet made from birch wood. Adorn your home with the elegance and artistic look of the gracefully designed Hokku Designs Emillio Loveseat. It features a robust hardwood frame that will endure wear and tear of time for years. 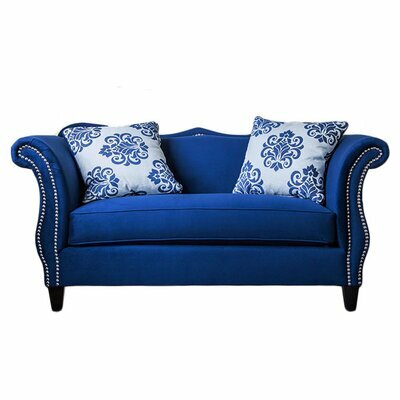 It is upholstered in deep blue soft fabric with glimmering silver nailhead trim that outline the stylish curves of the frame creating a visual delight. Carefully filled with Dacron-wrapped foam with no-sag springs at the core, the singular seat cushion is wide and spacious to provide endless comfort. Topped with two accent pillows with matching print, this stunning loveseat will impress your guests with its breath-taking looks. Frame is crafted from hardwood. Extremely soft 100% polyester upholstery. Available in more fabric colors including Lavender and Ruby Red. Includes two accent pillows with gorgeous matching print. Silver nailhead trim outline the elegant curves of the back and front panel of arm. Wide and thick seat cushion. Dacron-wrapped foam and no-sag springs for lasting comfort and durability. Espresso finished solid wood legs in tapered style. Add a classic touch to your living room with the elegant and traditional Klaussner Furniture Greenough Loveseat. This simple and graceful loveseat features double cushion seat, a dressmaker skirt with wide and comfy traditional rolled arms. It comes with two matching accent pillows and upholstered in brown microfiber that complements a wide array of room décor. This loveseat accommodates two people comfortably. Frame is constructed from wood, metal and manufactured wood. Standard design with traditional styling. Includes two matching fluffy toss pillows. Covered in brown colored microfiber. Durable sinuous spring seating system for ultimate comfort. 8 inches thick seat cushion offers ultimate comfort. Supported and balanced by brown colored plastic legs. Lifetime warranty on springs and frame; One year limited warranty on cushions and upholstery. Ideal for a rustic or a traditional home, the Hamptonburgh Loveseat will enhance the elegance of your living room. 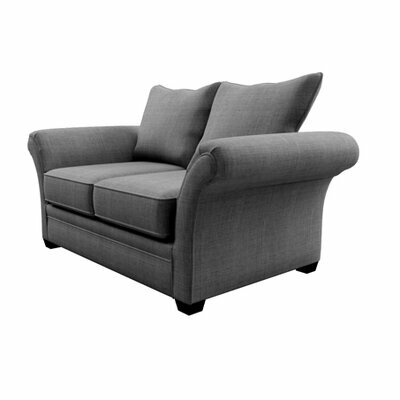 Equally perfect for your living room, bedroom or den, you can place this loveseat in any corner of your home. Thanks to sturdy wood frame, durable pocket coil seating and high-quality microfiber upholstery, this graceful loveseat is soft, comfortable and long lasting. 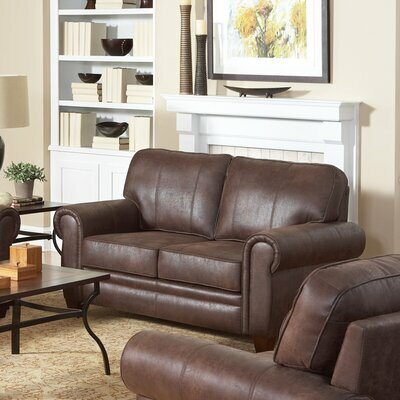 This lovely Hamptonburgh Loveseat features brown color that adds warmth to its traditional look. Create a wholesome look by adding this appealing loveseat with matching armchair, ottoman and a center table. Durable and soft microfiber upholstery. Durable pocket coil seating system. This loveseat is supported by brown colored block feet. Add a touch of grace and classic French style to your home with the stunning Louis Classic French Loveseat. It features exposed oak wood frame with antique finish and distressed look and elegantly shaped cabriole legs that add value to its overall look. The neutral beige-gray linen upholstery encases foam cushions to provide you relaxing and comfortable seating spot. Louis Classic French Loveseat Collection. Exposed oak wood frame with antiqued finish white streaking. Upholstered in durable neutral beige-gray colored linen. Cushions are filled with CA117 compliant polyurethane foam. Elegant wooden legs in cabriole style.